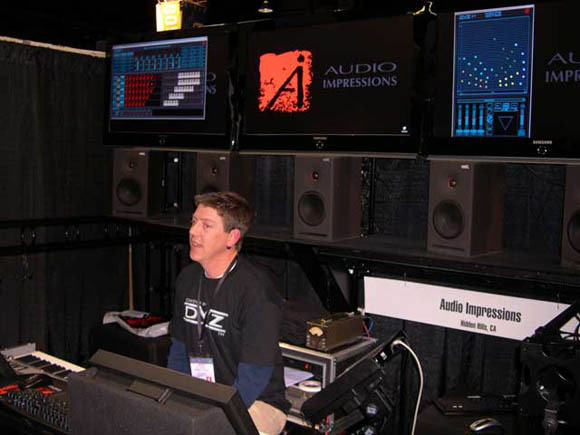 Audio Impressions had a working demo of their flagship orchestral library, DVZ. Well, ok—just the strings were demoed, but the full package with over 600 instruments is scheduled to de-vaporize and ship in March. DVZ (pronounced “di-vi-zee”) promises a unique experience for those yearning to achieve new realism for that film score sound. The string section emanating from their NAMM booth did indeed seem to hit the nail on the head. I was particularly impressed that it sounded so good being played straight from a keyboard. Part of the reason is that there is an algorithm that senses how fast notes are being played, so you can get articulations that make more sense without needing to be programmed after the fact through sample switching or tweaking attack and release times. So what else is innovative about DVZ? Ninety percent of the samples in the DVZ library are of individual players, and there are no samples of more than two players. This allows flexibility in programming that achieves realism on several fronts. First, the total number of players never changes no matter how many notes you play. Think about it: if you hold one note of a typical violin section patch it may sound like 12 players. Hold down a second note and suddenly you’re hearing 24 players. Hold down a four-note voicing and your virtual orchestra hall gets crowded quickly. DVZ has an algorithm that splits the notes up in an intelligent way, producing a performance that is based in reality—and sounds like it. You can quickly set the size of each of your sections, which will of course affect how intimate or big a sound you get, and it can also be made to match the size of orchestra allowed by a particular film budget. And since instrument parts are made up of individual performers, you can achieve the sorts of tonal variations that create a realistic sound. Why be locked into a few section samples as they were recorded? 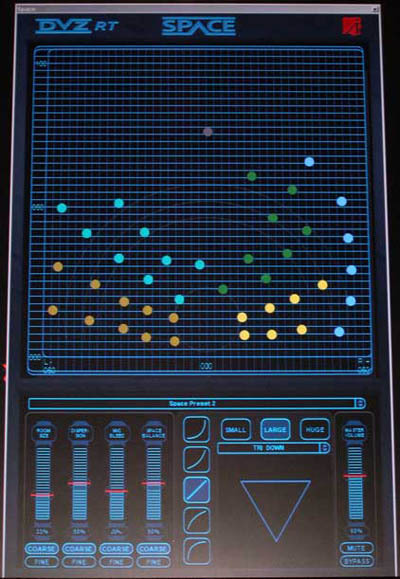 Individual players can also be moved around as dots in a virtual space. While I thought this might simply be accomplished through convolution reverb, it was explained that the SPACE programming module instead uses delay and phasing to emulate positioning and microphone bleed within a heavily multi-miked sound stage that has come to define that film score sound we are all used to hearing. Ok, if you are thinking of adding DVZ to your setup, there are a few things I guess I should tell you. First, it’s freakin’ expensive! The price hasn’t been set in stone, but indications are that it could be in the $10-$15k range. (Yes, k means thousand.) Believe it or not, this would make it competitive with other top-shelf orchestral sampling packages and if you are a working composer you might not bat an eye at the price. Also, to run the full orchestra with all its capabilities currently requires about six Windows machines—five for the samples and one more for the application. Hmm…this looks like a good job for 64-bit technology to come to the rescue—and it’s indeed on the drawing board. The DVZ application will be able to communicate with your software through VST and Audio Units. A Mac version is scheduled for later this year. Josh Jancourtz is live on the show floor in Anaheim for CDM.